Today, a merit badge. Tomorrow, the world! In an effort to keep up with the times, the Boy Scouts of America have unveiled a new merit badge to appeal to tomorrow's mad scientists: Robotics. 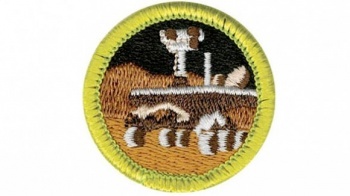 The new badge is the latest addition to the Scouts' Science, Technology, Engineering, and Mathematics (STEM) program. The STEM program is designed to make such subjects fun to learn, and Robotics is one of thirty-one related merit badges. service to others, leadership, personal achievement, and respect for the outdoors-will never change, we continue to adapt programs to prepare young people for success in all areas of life. Changes to the merit badge catalog are a somewhat regular occurrence. Requirements are updated, old badges are phased out, and new ones are created based on current trends and hobbies. However, I have to say that Robotics is a pretty cool idea. Not only is it both nerdy and cool, but it'll probably teach a lot of scouts about how to start their careers as future villains with android armies.